The slot machines having best of the both worlds in terms of brilliant graphics and sounds as well as interesting gameplay is always a winner. Fu Dao Le slots is a fine example of this sort of games. 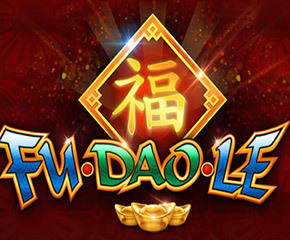 Fu Dao Le slots is developed by Scientific Games. They were the ones who first came up with a safe instant lottery game. They are a prominent casino software developer and have developed various online games too. 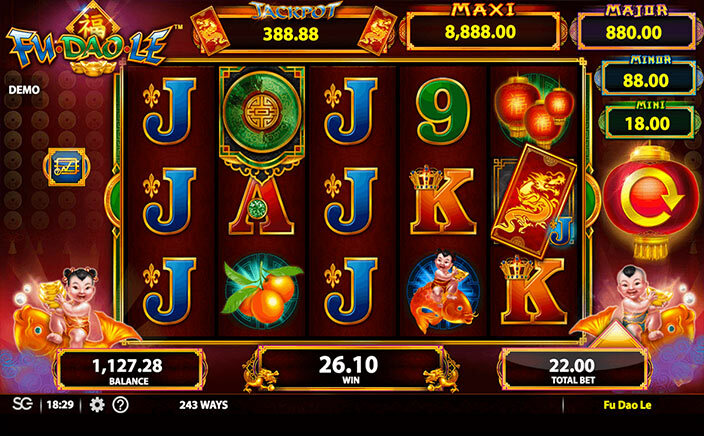 You will be playing on the five reels, three rows set in Fu Dao Le slots online. It makes use of now popular 243 ways to win format where you will be scoring prizes on all winning combos. The position of the symbols on each of the reels will not matter here. The symbols on the reels are a mix of Chinese themed symbols and traditional video slot symbols. Traditional playing cards ascending from ten to king depict the lower value symbols. Various fruits, lanterns, gold ingots and other symbols are the higher value symbols. 1. Free Spins– Whenever you hit 3 wild gong icons, this feature can be activated. You will be receiving instant 8 free spins as the reward. However, there is a twist, each of the free spins come with various benefits. You can have the whole reel transforming into stacked icons, and regular wild icons are accompanied by 2 times and 3 times multipliers. All this can enhance your payout even more. You also have a chance of reactivating extra free spins, whenever a gong icon appears; you receive an additional free spin. 2. Progressive Jackpot– There are four separate progressive jackpots in the fray here, these range from mini to minor, major, and maxi jackpots. You can win the jackpot through any of the two ways available. The first way is pretty easy and requires you to collect red envelope icon on the 1st as well as 5th reel during the same spin. When this happens, you are awarded one of the jackpots instantly. The second way involves a lucky icon which can fill an entire reel by expanding into a full stack. When that happens the Progressive Pick feature is activated at random. Fu Dao Le slots is an easy but interesting game to play. This is a Chinese themed slot which carries progressive jackpots along with other bonus features.